John Seddon has made an amazing discovery: Lean is failing! In a paper much anticipated by few, “An exploration into the failure of Lean,” Seddon and co-author Brendan O’Donovan “…show that the ‘Lean’ (Womack and Jones 1996) movement is based on a flawed interpretation of innovations” created by Toyota beginning in the 1950s. They argue that Lean “is a busted flush.” The paper eloquently states the obvious on this point and many others. Seddon and O’Donovan argue that “…lean was simply overlaid onto conventional Western management ideas…” Brilliant! They came to this insightful conclusion without using any Lean tools such as an A3 report! Not a 5 Whys in sight. No, it was cost reduction. To understand Ohno’s intent, Seddon and O’Donovan should have also carefully read and cited Ohno’s two other books: Workplace Management and Just-In-Time for Today and Tomorrow. It would be better still if they had spoken to people who learned directly from Ohno-san such as Chihiro Nakao. Mr. Nakao’s original (1973) internal document describing TPS is titled: “Toyota Production System for Cost Reduction.” Seddon and O’Donovan’s error destroys the premise of their paper. The first and still most accurate codification of TPS was made by Yasuhiro Monden in his 1983 book, Toyota Production System: Practical Approach to Production Management. Monden’s description of TPS was the result of his conversation with Ohno-san. Read this blog post to learn why cost reduction was the Toyota Production System’s most important goal. Unfortunately, Seddon and O’Donovan, as well as Womack and Jones, ignored Monden’s excellent work. But rest assured, any codification of TPS in the hands of incurious leaders will lead to poor outcomes. What most people still struggle with is that in TPS, cost reduction (via kaizen) is understood to result in simultaneous improvement in all parameters such as productivity, quality, lead-time, customer satisfaction, market share, respect for humanity, profits, and so on. In TPS, it does not make sense to reduce costs and simultaneously introduce trade-offs that negatively affect other parameters or people. This is not a “Western researcher” problem or a “codification” problem. It is a human cognition and human behavior problem. Lean has not been an impediment; confirmation bias has been an impediment to re-thinking the purposes and practices of management. Their call for “last rites” is silly and self-serving. People committed to Lean are upset when it fails and people are harmed. But, failure is how we learn, and often it takes longer to learn than anyone would like. Seddon and O’Donovan seem to not understand that TPS was created through trial-and-error, not by studying as academics or consultants are known to do. Lean management, as well as the Lean movement, must be created by trial-and-error. Unfortunately, there has been too little trial-and-error for both. As Nakao-san says: “Failure is not failure. It is a step towards improvement.” We just need need to make many more and faster steps toward improvement. Everything if life has an evolution – from the caterpillar to the butterfly. Only nature can be perfect. All techniques, methods, principles and philosophies are imperfect during their evolution leading to their mature state. We learn everyday from mistakes, course correct, take learnings forward and improve. This is an ongoing process of evolution. I have tremendous respect for J & J (James & John) et al. Everyone is trying their best to evolve. No one is perfect. No one is right and no one is wrong. This is a healthy argument which should continue to progress our road towards improvement. Mr. Seddon & Mr. O’Donovan are in a complete denial mode when it comes to Lean. They state that “Lean was simply overlaid onto conventional western manufacturing ideas” Wow this is a colossal mis-statement and 110% false. If these two men actually “lived” and actually “worked” within a true Shingijutsu Lean environment they would have seen scores of manufacturing concepts from the TPS that were totally new and never before seen in conventional western manufacturing. Taiichi Ohno, the Father of TPS, studied western manufacturing methods and he stated that he would take out all of the waste (muda) that was so obvious in western manufacturing methods. Once this was done he stated he would have a successful error free manufacturing method hence the Toyota Production System. Examples of TPS methods that never existed in conventional manufacturing: resetting the location of machinery into smaller cells in order to do “one-piece-flow” with in-line inspection and set to standard work. I could give scores of examples (SMED, kanban, 5S, kaizen, FMEA) that were born out of TPS. They were never simple overlays of western conventional ideas, they were develped from the elimination of the waste found in western conventional ideas! I studied and worked with former TPS masters such as Mr. Yoshiki Iwata, Mr. Chihiro Nakao and Mr. Akira Takenaka. All of these men were taught by Taiichi Ohno. 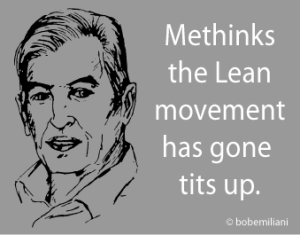 I suggest that Mr. Seddon and Mr. O’Donovan do some more studies of Lean before they make any more in accurate and false statements regarding “Lean”. They both should spent at least one year in an actual Lean Manufacturing cell, then they can state that they know something about Lean. To me, TPS means “Old Stuff Done in a New Way”. The old stuff is western systems and the new way is TPS.